Those of you who know me, know that I've been dancing since I was 2 1/2 years old. I have not kept all of my trophies because when you travel, the suitcase is only allowed so much weight. 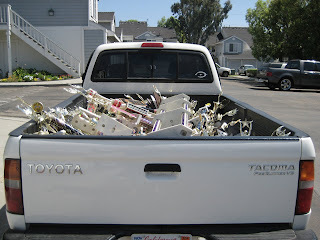 Our house has a small garage and it was time for me to get rid of my trophies. 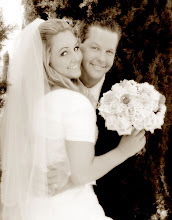 I took pictures and have a scrapbook I will put them in, but there were just too many. We counted a total of 133, that's how many I kept. 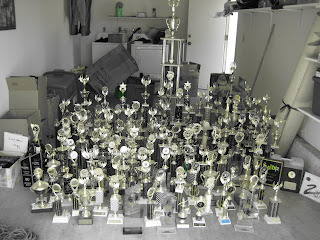 My trophies included all kinds of different competitions like showstoppers, showbiz, car, dance rave, starpower, etc. My two beauty pageants are in there also. I won Ms American Scarlett and Ms. Tropicana. I will post pictures b/c they are funny...those were my only pageants and I won both...and I'm glad it stopped after that haha. Oh my goodness! I am speechless. You are a well decorated woman!